Millenium Collegiate Classics is proud to present this special Collegiate Edition of one of the great Shakespearean tragedies. Macbeth is a dark and bloody drama of ambition, murder, guilt, and revenge. Prompted by the prophecies of three mysterious witches and goaded by his ambitious wife, the Scottish thane Macbeth murders Duncan, King of Scotland, in order to succeed him on the throne. This foul deed soon entangles the conscience-stricken nobleman in a web of treachery, deceit, and more murders, which ultimately spells his doom. Set amid the gloomy castles and lonely heaths of medieval Scotland, Macbeth paints a striking dramatic portrait of a man of honor and integrity destroyed by a fatal character flaw and the tortures of a guilty imagination. A recommended edition for serious study, with a new improved typeface and easy to read font, this handsome volume is a must for any home library collection of classics. 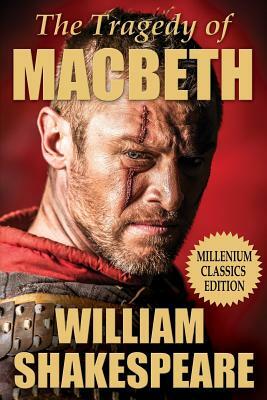 "This edition of Macbeth resounds with new fury." - New York Times Book Review.